Precarious courses are difficult to navigate without controlling your slice. It's insidious, and it can ruin a golf score. You have a chronic problem, and you have probably spent time and money to correct it. But in the end, it always comes back to haunt you. It's the dreaded slice. There are several reasons why golfers unintentionally slice the ball. They can happen during your address or as you swing the club. But there are steps that can be taken to correct them. As you address the ball, it's possible you are gripping the club too tightly, creating arm tension that will cause you to have an outside-in swing. Imagine you are holding a baby rabbit when you grip the club. Your grip should be hard enough to keep it from getting away but weak enough not to hurt it. Also, you might have a so-called “weak grip.” A weak grip means your thumbs are more on top of the club, so when you swing it, you will tend to open the club face and hit a slice. To correct this, turn your hands (clockwise if you are right-handed) so you see more of the knuckles of your left hand. 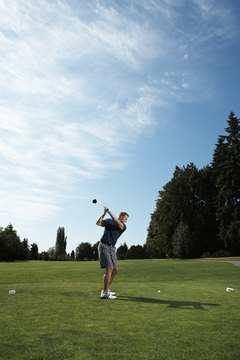 People who slice tend to place the ball too far forward in their stances, and that causes the shoulders to open wider than normal, thus creating an outside-in pattern. If you move the ball farther back in your stance, your shoulders will be more in line with your target. If you have a slice you cannot control, you might not be shifting your weight properly from your back foot to your front foot when you take a full swing. That will cause your club face to be open as it hits the ball. One way to do this properly is to hesitate at the top of your swing, then shift your weight to your front foot before you start your downswing. Another is when you complete your swing, continue by taking a step with your back foot toward the target. Take your club to the top of your swing and look at the direction the club is pointing. If it is pointing to the left of the target (if you're right-handed), you are swinging outside-in. Cure that by taking your club to about 18 inches above the ball, then take it back from there and pay attention to the plane of your swing. Then make your downswing, making sure its plane is inside that of your backswing. Try this again, but do so hitting a ball. Before long, you will be hitting the ball straight, without a slice.